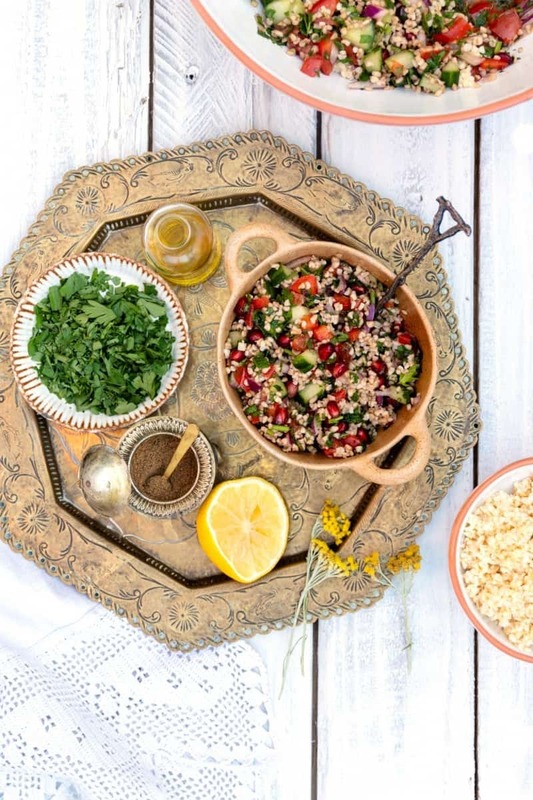 This super-healthy tabbouleh salad is easy to make and packed with flavour – a powerhouse of plant-based goodness! I have stuck pretty close to the authentic Lebanese recipe with a couple of minor twists. Tabbouleh, also known as tabbouli, tabouli, or taboulah, is a Lebanese recipe that has got to be part of your salad repertoire. It is simple and very easy to make, healthy, vegan and absolutely irresistible. The authentic Lebanese tabbouleh recipe is made up of mostly parsley – lots and lots of chopped parsley. Really, I cannot emphasise this enough! The other main ingredients are tomatoes, cucumber, spring onions, onion, bulgur wheat, lemon juice and olive oil. Some versions of tabbouleh contain only a scant amount of bulgur wheat – as little as a couple of tablespoons – and are mostly made up of chopped parsley. I have upped the bulgur wheat here to make this more substantial. Some versions use couscous instead of bulgur wheat, and there are also quinoa, farro and fregola (giant couscous) versions. All of them work quite well so pick your favourite. Tabbouleh is usually served cold and can be accompany a myriad of dishes from grilled chicken and meat and fish. The salad itself is vegan and it can also be part of a Middle Eastern meze feast. Bulgur wheat is my preferred grain for tabbouleh. Package instructions usually ask for it to be boiled for 15-20 minutes but it is even better to simply steam it. Place the bulgur wheat into a bowl (no need to rinse) and cover with twice the volume of boiling water plus the juice of half a lemon. Cover the bowl the let the bulgur wheat steam, absorbing the water. Leave for 15-20 minutes, drain excess water if there is any and fluff up with a fork. Let it cool before mixing into the tabbouleh. You can cook couscous in the same way though it will need only 5-10 minutes to absorb the water. My flatmate Jo used to make tabbouleh all the time when we were in college. It was cheap, cheerful, easy and filling – perfect student food! Her version was anything but authentic – she used lots of couscous with a little parsley, any veggies lurking in the fridge plus cubes of Cheddar cheese. Mock if you must, we thought it was the height of sophistication back in the day! My current version sticks fairly close to the traditional Lebanese recipe with a couple of minor additions that, although not traditional, stick very close to the essence of the recipe. I like to add chopped bell pepper, pomegranate seeds and pomegranate molasses into my salad plus a teaspoon of Baharat. You can add more veggies if you like, spring onions are pretty authentic but you could also add zucchini, chopped spinach, chopped lettuce etc. This salad is a powerhouse in terms of goodness! If you haven’t come across Baharat before, it is a mix of seven Lebanese spices* and you can find it pretty easily these days online or in major supermarkets and ethnic stores. If you can’t find Baharat you can simply leave it out or add a generous pinch of ground allspice instead. Step 1. Prepare your bulgur wheat by placing in a bowl and topping with twice the volume of boiling water plus the juice of half a lemon. Stir and cover the bowl. Set aside for 15 minutes while you prepare your vegetables. Once the bulgur wheat has absorbed most of the water, drain and fluff up with a fork. Leave to cool. Step 2. Rinse the parsley and pat dry. Chop the parsley, discarding the stalks. Finely chop the mint if using. Step 3. Seed the tomatoes, cucumber and bell pepper. Chop all your vegetables into small, even cubes. Step 4. Add all the vegetables, pomegranate seeds, bulgur wheat and herbs into a large bowl. Add the olive oil, lemon juice, pomegranate molasses, baharat and salt and give everything a good mix. Chill the salad until ready to serve. This super-healthy tabbouleh salad is easy to make and packed with flavour. I have stuck pretty close to the authentic Lebanese recipe with a couple of minor twists. Prepare your bulgur wheat by placing in a bowl and topping with the boiling water plus the juice of half a lemon. Cover the bowl and set aside for 15 minutes while you prepare your vegetables. Once the bulgur wheat has absorbed most of the water, drain of excess water and fluff up with a fork. Seed the tomatoes, cucumber and bell pepper. Chop all your vegetables into small, even cubes. Rinse the parsley and pat dry. Finely chop the parsley, discarding the stalks. Add all the vegetables, pomegranate seeds, bulgur wheat and herbs into a large bowl. Add the olive oil, juice of remaining half lemon, pomegranate molasses, baharat and salt and give everything a good mix. Taste and adjust the seasoning if needed. Chill the salad until ready to serve. Try replacing the bulgur what with couscous, quinoa or farro. You can vary the ingredients according to your preference – I haven't used any garlic but you can add 1 minced clove if you like. Add crumbled feta cheese or grilled chicken for a more substantial salad. Increase the lemon jjuice if you like it really tart! I’m definitely going to try this recipe. Our stove is broken at the moment, so I need recipes that are healthy and don’t involve a stove. Thank you for sharing! A simple, yet delicious dish. Great for feeding the family, or having with your barbecue. It looks great with the lovely colours. Loving all the colors and fresh flavors in this salad. It is a colourful feast for the eyes and belly! What a gorgeous salad! Love all those fresh flavors. I don’t think I’ve ever seen pomegranate in tabbouleh before, but it sounds delicious. It adds such a nice colour and crunch! Sounds wonderful and it’s certainly colorful and beautiful. Also, thank you for the tip on baharat. I love trying new spice mixes. This is one of my favourite salads to make. The more herbs the better I say!